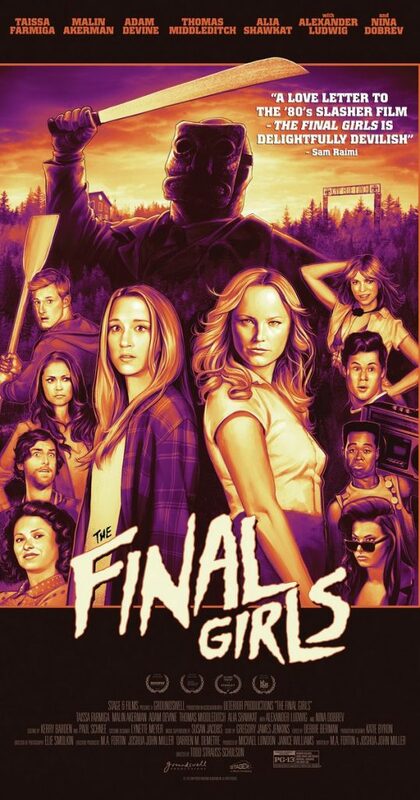 The Final Girls take the classic 80’s slasher genre, tosses in some comedy (as well as some actual tear-jerking moments), and manages to pull of a unique and ridiculously entertaining film! OMGWTFBBQ! I make a real effort to not be one of those people who talks up a movie so much that it builds up to a letdown… but man, I was pretty impressed with The Final Girls. This one would have flown right under the radar with me if I hadn’t seen a thumbnail of the Blu-Ray cover while doing some early Christmas shopping on Amazon. I pre-ordered it as a present, but after it arrived I completely forgot about it until I found it by my desk a couple weeks ago. 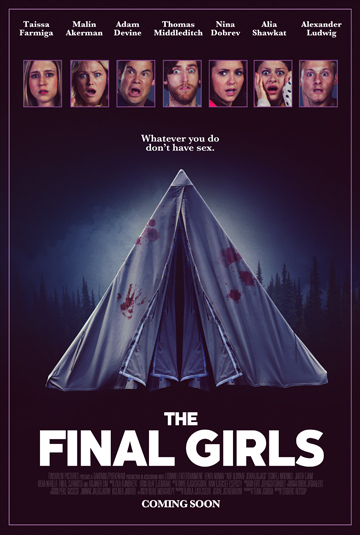 Not once since shopping on Amazon have I seen or heard mention of The Final Girls anywhere online. How is that possible? We may never know. Plot: A young woman grieving the loss of her mother, a famous scream queen from the 1980s, finds herself pulled into the world of her mom’s most famous movie. Reunited, the women must fight off the film’s maniacal killer. So, to expand on the plot a little – Girl’s mother dies. Years later, girl attends an anniversary showing of the slasher film her mother did in her twenties. Theater catches fire, girl and her friends escape through the screen only to find that they are inside the slasher film. Knowing the plot already, they decide to pair up with the girl who, at the end of said slasher film, is the one who survives and kills Billy Murphy (aka Bad Guy with machete aka Jason Voorhees ripoff). But, their interfering changes the plot, and the “final girl” dies. Now, they need to find a way to defeat Billy Murphy before he murders them all. Only then, will they be able to attempt getting back to their world. 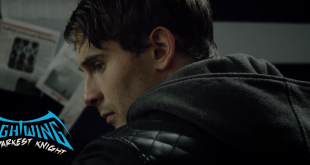 Two thumbs up to the filmmakers – they managed to throw comedy, horror, and tear-jerking little moments all wrapped inside a neat little PG-13 package! I was making a comment to my buddy (3/4 of the way through the movie) about how they were actually doing a great job of keeping the blood and gore and violence to a tasteful amount, to which he replied, “Well yeah, it’s only PG-13.” And I actually had to check the case to confirm it. I guess in my old age I have just become bored with the constant barrage of blood and gore. It’s not like I am being stuck up about it, in fact I spent the better part of high school, college, and some of film school taking in as many horror flicks as I could find. Then, almost suddenly, I was just over it. I remember it like it was yesterday (cue dream sequence)… A couple friends dragged me out of my apartment to go watch Hostel in one of the theaters downtown, I think during my first year of film school. I hadn’t heard much about the movie, maybe I had seen a preview at some point. But after sitting through all 94 pointless, disgusting minutes, I got up and told my friends that I wasn’t into horror films anymore. Not if that’s where the genre was going. And it isn’t like that was the first gore-filled horror film I’d seen. I remember going to the premiere of the new Texas Chainsaw Massacre in 2002 or 2003 when I was in Canada, and maybe that was the first inkling of a taste shift for me. I just wanted more substance, you know? But it was TCM, a reboot of a classic (a classic that I never liked, but it got a little slack from that). I tried not to be picky, since most of the 80s slashers and 90’s horror films didn’t always do great on the plot, but I think people tend to amplify their awesomeness because “they’re classics”. I’m guilty of it too! But I’m over plot-less horror films at this point. I know that was a long winded way of explaining why I was impressed with the non-R rating that the film received. It isn’t because I’m squeamish and can’t handle the sight of blood… Rather, I’m impressed that someone can mimic an 80’s slasher flick so well that the viewer doesn’t even notice they aren’t watching a rated R horror film. The characters in the film were pretty excellent. Taissa Farmiga and Malin Akerman’s whole back and forth (both as mother daughter, and as counselor friends) was hilarious and heartwarming, and was directly responsible for the three times that I shed tears during this film. Adam Devine and Thomas Middleditch played two douchebag guys that viewers secretly hope will be the first to go at the hands of Billy Murphy and his machete. Nina Dobrev plays a great “bitchy ex-girlfriend” to Alexander Ludwig, and she almost gave me a teary eyed moment at one point, too. And Angela Trimbur, who went from being just another character to possibly one of the funniest in the movie, gave a Billy-Murphy-luring “striptease” that may be one of the greatest, most ridiculous things you have ever seen. The film even sparked a heated (yet healthy) debate between me and my buddy – if you were trapped in a horror film, would you try harder to save the people who went in with you, or the “fictional character” that your deceased mother played? We actually had to pause the movie to hash this one out. If you saved your mom, could you get her out of the movie? Are the characters in the film just as human as you are at that point? Or are the characters really just characters who can’t exist outside of the film? We had opposing views on the topic, and I got a little headache from the discussion. From the filmmaking side of things, this movie had a really some elaborately-staged motorized crane shots that had me nodding my head in approval as we watched. The scene where the fire started in the movie theater was a super fun sequence to watch, and the lighting during the final fight scene was AAAAAH-MAZING. I don’t know if you know this, or even why you would know this, but I am really into retro synthwave music, futuresynth, the whole “neon” music scene in general… I am just obsessed. Don’t ask why; I’ll touch on that in a later post. 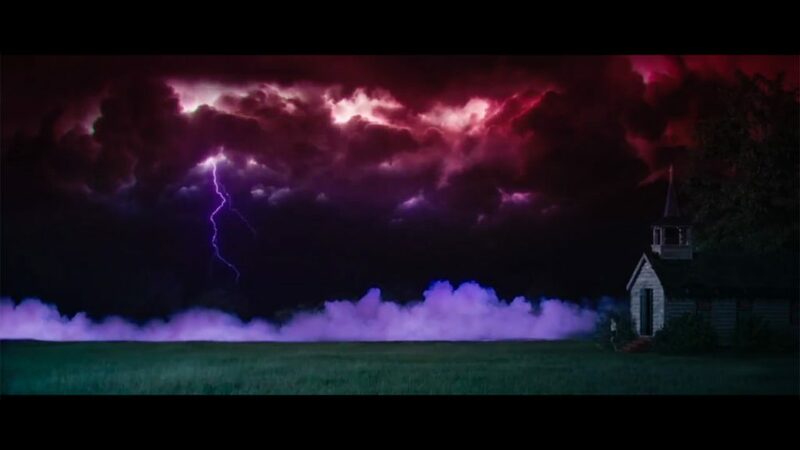 But that ending scene, with the fog and the lightning and the purple and red tones… well, I don’t even think “inspirational” is enough of a word to encompass how pumped I was to make films and make music after seeing all of that. Honorable mention for the soundtrack too – 28 tracks of retro, horror film inspired music. Simple, and fun. Worth the $9.99 price tag, indeed. Oh, and if you happen to be checking out the Blu-Ray, I was watching it via Playstation and found a “secret” behind the scenes clip by going to the far right on the menu and pressing the up button. It shows a behind the scenes clip of one of the cool remote camera tracking shots, which was super neat to watch. Cheers and all that good stuff!